A radio frequency band near 1900 MHz. It includes all of the frequencies in band 2 (PCS), plus the newer "G block" that extends the band upward to a slightly higher frequency. In the US, the "G block" is owned exclusively by Sprint and used for their LTE network. Phones must specifically support LTE band 25 in order to use Sprint's LTE network in the G block; phones supporting LTE band 2 will not work. 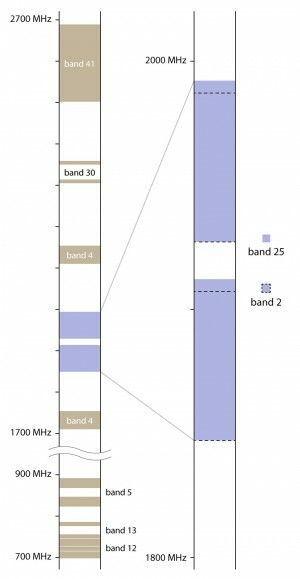 However the reverse is not true; since band 25 includes blocks A-F and G, a phone with LTE band 25 could theoretically be compatible with an LTE band 2 network.